This fact sheet series is based on the original research from the project “Maximizing the Gains of Old and New Energy Development for America’s Rural Communities.” This series summarizes the research into six chronological fact sheets to inform the reader of economic impacts related to energy development. According to the fact sheet “Characteristics of a Boomtown,” a boomtown can be defined as a community undergoing rapid growth due to sudden economic shock. While there is a long history of U.S. boomtowns linked to natural resource development dating back to at least the 1849 California gold rush, there is also a long history of boomtowns that go bust. In 1918, Desdemona, Texas, a town that was a peanut farming community, was transformed when oil was discovered. With oil came new residents, new homes, greater wealth, and a greater strain on local resources. After the oil production dropped in 1921, the city government dissolved and the town’s only school closed its doors (Miller, 2011). In 2008 the southeastern part of Ohio began to experience an increase in oil and gas exploration. During this time oil prices were still roughly $100 per barrel and technological gains provided energy companies the ability and motivation to access the hydrocarbon resources in the Utica Shale formation. This development has created an economic boom for local governments, landowners, and individuals looking for employment. Not only did local county governments experience dramatic increases in sales tax receipts, landowners leased or sold their mineral rights and local residents looking for work had the opportunity to be trained for a career in the energy industry or supporting service sectors. Typically, the bust of an energy boomtown occurs when volatile energy prices weaken or the natural resource is depleted leaving the community to deal with the aftereffects. For example, early in 2016 when the cost of oil dropped to around $30 per barrel, energy companies reduced production or in some cases discontinued production altogether, leaving less revenues for local governments, and fewer jobs for local residents. This phenomenon is often referred to as the “resource curse,” and provides the catalyst for a boomtown bust. Lack of new business investment outside of the direct industries affected in the region as a result of diminished workforce availability, and increasing property values and wage rates. Existing businesses struggle to expand due to competition for a workforce that is both available and adequately trained. Lack of innovation, venture capital investments, and small business development. Community infrastructure project decisions that are dependent on an energy sector tax base can threaten the community in the long-term during energy busts. Policy strategies to reinvest revenue from energy sector development is essential to local government’s ability to avoid the bust. Communities that are heavily reliant on industries in the natural resources sector are susceptible to the natural resource curse, which can, in the long term, negatively influence the local economy, social dynamics, and environment. There are a number of key reasons for a situation to develop that impacts local residents, community organizations/businesses, the local community itself, and the natural environment (Image 1). 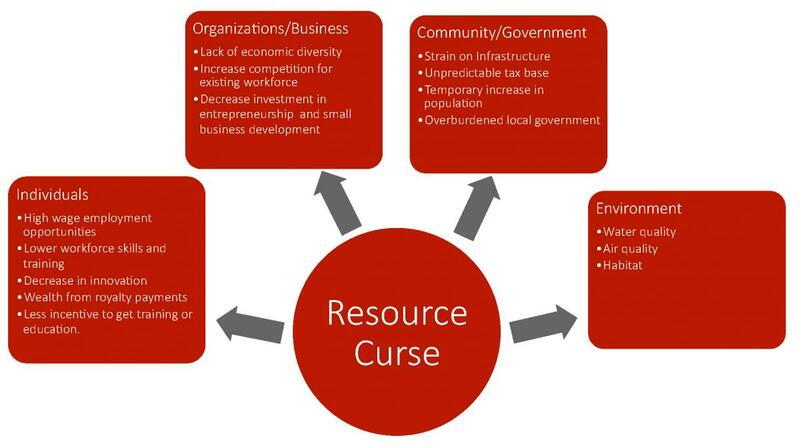 Specific impacts of the resource curse influence individuals in a number of ways. According to Kelsey, Partridge and White (2016), in the initial stages of the energy boom, workers move in, wages rise for affected workers, and land owners receive lease and then royalty payments (though many may be absentee landlords). During the initial boom cycle, there are employment opportunities for local residents as well as for migrant workers from outside the region. Migrant workers earning pay may send some of their income “home,” therefore not benefiting the local community. These workers are attracted to these types of jobs in the energy sector because they are abundant, high paying, and require little training. After the boom, trained industry workers are more likely to leave and follow the industry when it moves on to new drilling opportunities. Kelsey, Shields, Ladlee and Ward (2011) found that nearly two-thirds of the influx of workers into the Pennsylvania Marcellus shale play were from out of state. Furthermore, due to the abundancy of high paying jobs, individuals are less likely to invest in higher education and additional training, and instead enter the energy sector workforce. Over time, this will result in a workforce that lacks the innovation and drive for new business start-ups, which becomes problematic when the boom ends. Impacts of the resource curse influence organizations and businesses in a number of ways. Energy development can limit new investment, local expansion, and new business start-ups in other areas of the economy, leading to an undiversified, specialized economy. In addition, overconcentration in the energy area is not conducive for growth in other job sectors. Non-energy employers will be reluctant to invest in this geographic area because of the lack of diversity in workforce skills. Finally, overconcentration in the energy sector will crowd out other sectors due to increased land and labor costs during boom periods. Employers would rather look elsewhere for land and labor at reasonable costs. Lack of economic diversity due to an overconcentration in any sector—including energy—is not conducive to growth as diversified economies outperform local economies concentrated in a few sectors (Hammond and Thompson, 2004). Lastly, resource based economies are not associated with entrepreneurship and small business development, which also serves to limit diversity in the local business sector. Specific impacts of the resource curse influence community and government in a number of ways. A bust town places great demand for local government services that are often unattainable. While the initial surge of residents and the need for new roads and other supporting infrastructure can lead to a growth in government expenditures, as the boom dissipates, the real fiscal stress begins (Kelsey et al., 2016). Local governments will still need to maintain the new infrastructure, but they end up with fewer residents/businesses to pay for it. Local governments may also have some additional social expenditures as the energy sector economy slows. Emergency services, for example, may be expanded with additional employees, but they may not be needed as the bust sets in. Not only does the tax base of the local government dwindle as the number of residents falls, but those who remain may not be able to pay the taxes necessary to meet the revenue requirements necessary to support the new infrastructure. Another contributing factor for the resource curse is environmental degradation. When dealing with the extraction of natural resources, damages to the environment could occur. Kelsey et al. (2016) indicate that natural resources extraction could cause water pollution, air pollution (both dust and other pollutants), or traffic congestion. Additionally, ecosystem changes could also adversely affect the environment. They note that in certain places, unconventional drilling is also associated with some small earthquake activity. Negative environmental issues could affect peoples’ attitudes towards the community, impacting on important amenities, which attract new residents and economic activity. In general, overreliance on any one economic sector can position a local economy to struggle in the long run. Past evidence indicates this is very much the case with the energy sector. The resource curse occurs in areas or regions that are known to have an abundance of energy resources. While short-term gains in government revenue and employment opportunities result from the energy boom, potential long-term negative consequences could occur. If communities are fortunate enough to have an abundance of energy resources, they must proactively plan to avoid or limit the economic bust that often occurs. Diversifying their economic profile and strategically enhancing their community capital such as human, built, and natural environment is of critical importance. While not all communities react the same way to an energy economic shock, history teaches us that with every economic boom there is potential for an economic bust. However, communities that prepare for the economic downturn will be better able to equip themselves when the bust comes. Also, if and when the boom returns, they will be better equipped to take advantage of increased economic activity. This material is based upon work that is supported by the National Institute of Food and Agriculture, U.S. Department of Agriculture, Agriculture and Food Research Initiative, under grant #11400612 titled “Maximizing the Gains of Old and New Energy Development for America’s Rural Communities.” The authors acknowledge and appreciate the support of both the USDA AFRI grant and the project team from The Ohio State University, College of Food, Agricultural, and Environmental Sciences, Department of Agricultural, Environmental and Development Economics. Any opinions, findings, conclusions, or recommendations expressed in this publication are those of the author(s) and do not necessarily reflect the view of the U.S. Department of Agriculture. Hammond, G.W. and E. Thompson. 2004. Employment Risk in U.S. Metropolitan and Nonmetropolitan Regions: The Influence of Industrial Specialization and Population Characteristics. Journal of Regional Science 44: 517–542. Kelsey, T., Partridge, M., & White, N. (June, 2016). Unconventional Gas and Oil Development in the United States: Economic Experience and Policy Issues. Applied Economic Perspectives and Policy, 38, 2, 191-214. Kelsey, T.W., M. Shields, J. Ladlee, and M. Ward. 2011. Economic Impacts of Marcellus Shale in Pennsylvania: Employment and Income in 2009. Williamsport, PA: Marcellus Shale Education & Training Center. Joseph Miller. “10 Boom Towns that Went Bust.” 12 October 2011. HowStuffWorks.com. http://money.howstuffworks.com/10-boom-towns-that-went-bust.htm. 20 January 2016.